Jason Segel wears blue high top Converse “Chuck Taylor” All Stars in the film. The Muppets are back together again. 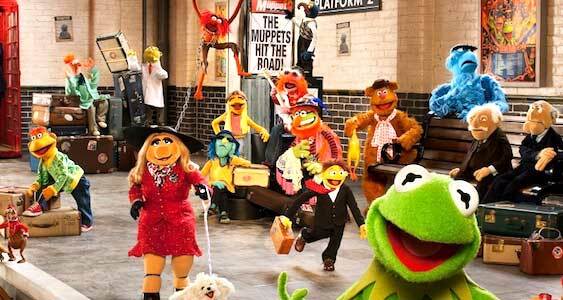 In the 1970’s and 1980’s, the Muppets were a cultural phenomenon after the success of their tv show, The Muppet Show, and their numerous films. However, in the late 1990’s and 2000’s, the Muppets faded from the public eye. In 2011, they made their big comeback with their smash hit film, simply titled The Muppets. The film stars Jason Segel, Amy Adams, Chris Cooper and Rashida Jones as the main human characters, and features a slew of cameos including appearances by Emily Blunt, James Carville, Leslie Feist, Whoopi Goldberg, Selena Gomez, Dave Grohl, Neil Patrick Harris, Judd Hirsch, John Krasinski, Rico Rodriguez, and Mickey Rooney. Scooter sweeps up the old Muppet Theater in red chucks. 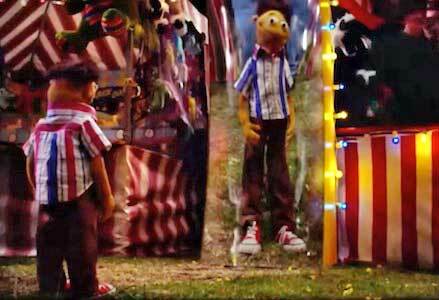 The film starts in Smalltown, U.S.A. with Walter, a Muppet, and Gary (Segel) growing up. We see that Walter wants to desperately fit in with those around him, but because of his height and appearance, that’s not always so easy. However, his brother Gary always has his back, and they bond over their mutual love of the Muppets. When they reach adulthood, we see that Gary and his longtime girlfriend, Mary (Adams), are planning a romantic getaway to Los Angeles when Gary unexpectedly invites Walter to come along so he can see the Muppets Studio. This slightly annoys Mary, but she goes along with it because she loves Gary. 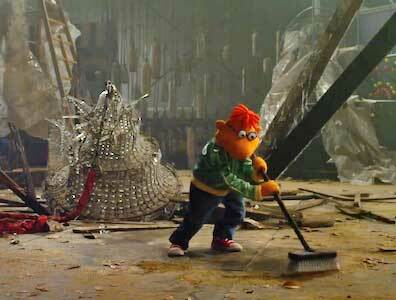 When the trio get to the Muppets Studio, they see how run down and decrepit it has become. Unbeknownst to them, the Muppets haven’t performed together in years, and the studio is about to be purchased by oil baron Tex Richman (Cooper). Walter overhears Richman reveal his plan to destroy the theater and drill for oil underneath. Walter explains to Gary and Mary that if the Muppets can raise $10 million by the time their original contract expires, they can repurchase the theater. So, the trio runs to find the Muppets and bring them back together. Jason Segel arrives at the Muppet Studios with Walter and Mary. They find Kermit, and let him know of Richman’s plan. Although Kermit is initially hesitant, since the Muppets have been broken up for some time, our trio eventually convince him to try, and he sets off with the them to reunite the group. Over the course of a montage and a couple funny scenes, we see what the gang has been up to since the break up. However, they can’t convince Piggy to rejoin them. The Muppets return to Los Angeles and pitch their telethon idea to several television networks, but are rejected multiple times. Following a cancellation, TV executive Veronica (Jones) gives the Muppets a two-hour slot, on the condition that they find a celebrity guest. The Muppets refurbish the theater, but their first rehearsal is unsuccessful and Kermit is unable to contact a celebrity guest. Miss Piggy returns, but informs Kermit that she refuses to work with him. Eventually, the gang is able to pull together and find a guest host, and the show goes on, but there are some setbacks. The Muppets don’t end up raising the money needed, but their comeback is enough to revive their careers, so they’re truly together again. Jason Segel wearing blue chucks while launching Walter off a seesaw. This is the perfect movie for the Muppets “comeback”. It has so much heart and humor, with references to Muppet history past for longtime fans. The introduction of Walter is a welcomed sight, as he is so pure of heart and such a fan of the Muppets that it makes it impossible to not root for him. 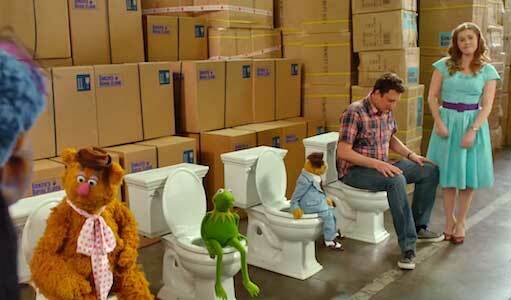 The humor in the film is top notch as the Muppets aren’t afraid to make fun of themselves and the world they’re in. If you’re a fan of the Muppets, this is a definite must watch. Walter envisions what it would be like to be human size like his brother. 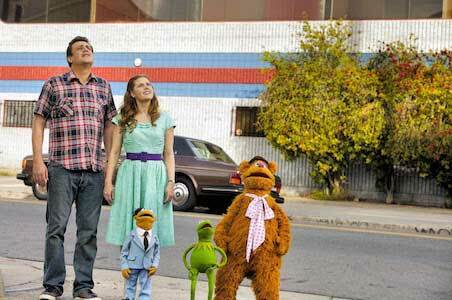 Jason Segel and a few Muppets wear chucks in this musical comedy. The best chucks scene in the movie is the first musical number of “Life’s a Happy Song”. This scene occurs at the very beginning of the movie, and is set up by Gary telling Walter that he’s invited to California with him and Mary to see the Muppets Studio. They celebrate by singing a song about how great everything is going. During this number, they compare life to a litany of everyday things like a piece of cake, an easy road, a leg of lamb, a bunch of flowers, and, somehow, a filet of fish. It’s also during this number that we see both Gary and Walter wearing chucks, while they ride a dual tandem bike and as they have fun on the seesaw. Since Smalltown represents picturesque 1950’s America, many of the extras in the background also wear chucks during this scene. The chucks really help establish the time period, and are a good natured look of both Gary and Walter. The song is extremely catchy, and the scene is definitely well choreographed, giving a modern look to the classic musicals of old cinema, while also highlighting Gary and Walter’s close relationship. 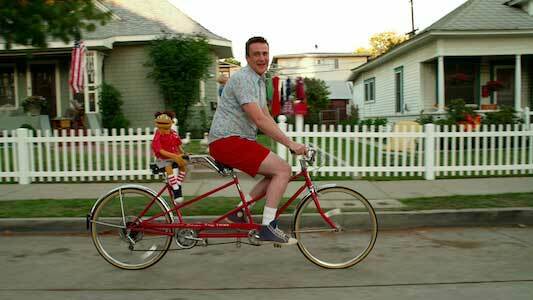 Jason Segel and Walter wear chucks while riding a tandem bike during “Life’s a Happy Song”. The Muppets. (2011) Jason Segel, Amy Adams, Chris Cooper and Rashida Jones. Directed by James Bobin. Categories: Comedy, Musical, Family.